Meet the newest member of the Sargent family. Sometimes it is hard to open those sleepy eyes! Daxton Tyler Sargent. 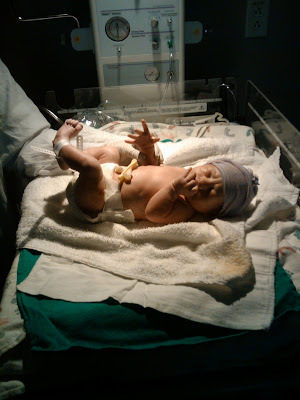 He was born Sunday, August 21, 2011 at 6:02 pm. He measured 19 inches long and weighed in at 6lbs 11 oz. So as a lot of people have noticed, I've been ready to have this kid for a while now. I was counting down and really starting to feel like September would never come. So when I heard I was dilated to a 3 and 50% effaced at 35 weeks and 5 days (they were pretending like I was 36 weeks already at this appointment) I was having a really hard time not getting my hopes up that this meant our newest little boy would come early. Luke only graced us with his presence 3 days before his due date so that didn't give us much room to think this one would do much different. Well, when we went to Bear Lake with my family 2 weeks ago I hit the 36 week, full term mark and I told everyone we would be having the baby soon. I was also freaking out a little inside because all of a sudden it was setting in that this baby COULD come at any time he felt like it. But I pretended like I wasn't freaked out and at the end of our weekend of fun, I told everyone, "Bye! See ya after this baby's born!" My mom was like, "That's too long" and called me a tease or something like that. Fast forward one week. Saturday August 20, I started having some pretty normal Braxton hicks contractions while I was getting ready for the day that morning. I was really excited because I had a girl's day planned to go get lunch (which was amazing), pedicures (which was relaxing), and then frozen custard (so yummy) with my dear "etc." (kind alike a bestie only different) Jessica McAllister. All day people kept asking how much longer I had until I was due and I would tell them, "3 weeks, but I'm getting a pedicure today so hopefully he'll decide to come tonight." All day I kept having the same practice contractions and some of them were pretty strong. I even tried to time them a few times and they were pretty irregular so I just ignored them and went about my day. By dinner time that night the contractions were starting spread around my whole belly and a little in my back like real contractions and I started to really wonder if I might go into labor soon. I know some women have false labor for days or longer before they go into real labor, so I figured it could still be 3 weeks but the fact that they'd been going on all day and getting stronger made me start to freak out again. This kid could actually be on his way! My nesting went into overdrive because we'd started a couple of new projects when I got back from my awesome (and much needed) girl's day, so our house was a complete mess. Tyler had put a few holes in the ceiling to try to get the cold water line from the laundry room to the kitchen, and found birds nests in the attic which made a mess. So I started trying to clean up a little just in case I did go into labor because I didn't want anyone to see my house such a mess. I didn't get much done though because Tyler told me to calm down and go to bed. I'd been out walking earlier that evening with a big water bottle because if it was false labor, walking and drinking a lot of water is supposed to either make the contractions stop or kick them into gear so they organize and turn into real labor. Nothing really changed all evening though so I was feeling pretty confused and decided to take Tyler's advice and go to bed. If it did turn into real labor I knew I'd need my strength. At 12:20am I was awakened by a very strong contraction. This one went into my back and took some deep breathing. With Luke I gave birth naturally using the Marie Mongan "Hypnobirthing" method. I didn't feel like I was very good at it, but it did what I needed it to so I had decided to use it again. The contraction wasn't too bad but it definitely felt like a real contraction not a practice one anymore. I continued to have them 10-15 minutes apart all night long. So this meant I slept for about 5 minutes and then had a strong contraction and then slept for 5 minutes and so on. They were getting stronger and some were a little difficult to focus through, but I really wanted to do as much on my own as possible because I wanted Tyler well rested so he could help me better when I really needed him. When I had Luke, I woke Tyler up at 3 am when I started having contractions and he barely got anymore sleep and was really weak, tired and feeling sick during the time I needed him to be the really strong one during the labor. I knew the longer I could handle them without him the better for both of us. By morning the contractions were really strong and I couldn't multi task anymore like I had been the night before. I told Tyler he better call his mom and see if she could come get Luke so we could focus on either stopping my labor or getting it to progress because I was really tired and starting to get discouraged. The contractions were moving more into my back and getting extremely difficult to handle. If they kept getting stronger in my back but not closer together and causing me to progress toward giving birth I didn't know if I'd be able to handle them naturally like I wanted to. Strong labor in the back is a pretty good indicator that the baby is posterior, or facing forward rather than facing my back causing the back of the baby's head to put a great deal of pressure on the back of the sacrum or whatever it's called. We started trying different techniques to try to encourage the baby to turn, and Tyler's mom came and got Luke. I called my CNM (certified nurse midwife) to ask for some advice. Of course, it's just my luck that my CNM wasn't on call for the weekend, so I spoke with the CNM who was on call. She happened to be the only other CNM I'd made an appointment with and the check up I'd had with her didn't leave me with a very good impression. 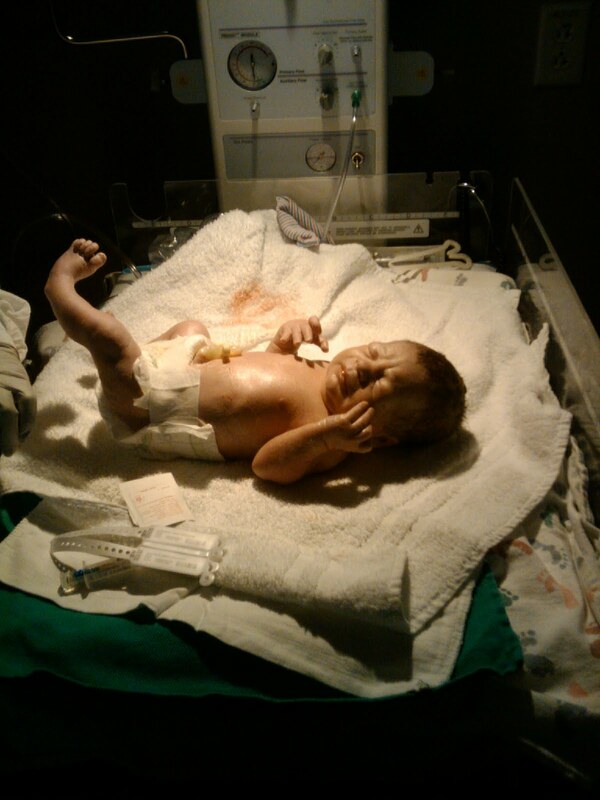 It made me really frustrated that my CNM wasn't the one on call... again just like with Luke's birth. She said that they baby would have to turn on his own and if I wanted I could come to the hospital and get pain medication but that was about all she had to say. I was really frustrated when I got off the phone. I couldn't help feeling discouraged because I didn't know how to get the baby to turn, she said he'd just have to do it on his own, I was in a lot of pain, I hadn't had much sleep, my CNM wasn't on call, and the only CNM who was on call seemed like she really couldn't care less. So, we spent a few hours trying different techniques. Thank goodness our neighbor's internet was still up and working so Tyler could do some research and keep me trying different things. He was really awesome. I know he felt like he had no idea how to help me, but he was helping a lot. I called my parents and talked to them about the situation and they agreed that they thought the baby must be posterior to cause me so much back labor. I could barely feel any labor in the front because the back labor was so intense. They said my dad knew some acupressure points he could try that might help the baby turn. When they arrived, my dad got to work but it was really hard to let him work on me because it seemed like every time he started doing something it would bring on another contraction. I was having a really hard time relaxing through the pain in my back but we were out of ideas. 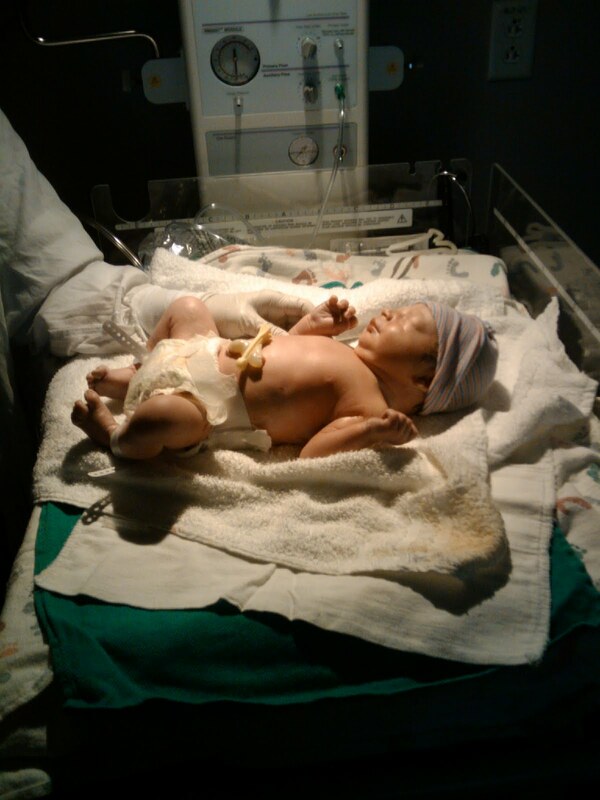 My dad was successful and soon the labor was more in the front and MUCH more manageable! Within the a few minutes the labor was so strong I could feel it down in my legs and so I knew it was time to get to the hospital, especially because I tested positive for Group B Strep so they were going to hook me up to penicillin for 4 hours and wanted me to still be in labor for 4 hours before pushing so the baby would get the penicillin and be protected from a potential blood disease. My dad drove us in our car so Tyler could help me work through the contractions when I needed him to, and my mom followed in their car so they could leave us there. I was grateful to have Tyler in the back with me because even though they weren't as painful as before, I was so tired and the strongest contractions became very difficult to relax through. When we got to the hospital they took us to triage to do whatever they do and they made me lay on a bed to be checked and hooked up to the penicillin and monitors. Then this nurse started asking me all this information and she seemed really impatient about it because I couldn't really answer in the middle of my contractions. I finally said, "I thought I pre-registered, why do you need all this information again if I pre-registered." I guess that was a rude thing to say because she seemed annoyed or offended or somethings and said that they do it with everyone who is admitted. What's the point of pre-registering then??? They checked me and I was dilated to a 7 and probably 90% effaced. A nurse started my IV and I was so impressed with how well she did! I get so nervous about getting poked and IV's really freak me out. I didn't feel anything! I didn't tense up, and it didn't hurt after she put it in. Every other IV has ached when I move or hurt when they put it in, or nearly caused me to pass out because they missed the vein or whatever they do sometimes. Her movements were fluid and gentle and I hardly even noticed she was doing it. By the time I had been at the hospital for 3 1/2 hours I was feeling the urge to push. I told the nurse and she called the CNM in and said that the last time she'd checked me I was dilated to a 9 and it had been a while so I was probably complete. The CNM said, "Well 3 1/2 hours is going to have to be close enough." She called the whole team in to be ready when the baby was born and we got ready to push. I had her break my water because it hadn't broken yet and I was really looking forward to the relief of pressure that brings. After she broke the water she checked me and said that the cervix had snapped back a little after the bulging bag had broken, leaving a lip. I didn't really know what she was talking about so she said, "It's like you're dilated to a 9 and 3/4. The baby's head just can't quite get past that lip." She told everyone false alarm and told me not to push until the lip was gone. My thought at this point was... "are you kidding me?! you want me to NOT push when my body is going to push no matter what I do???! Have you ever tried not to push when you body says to push? I don't think it's possible." I did my best not to say it out loud though. I did my best not to push but my body was doing it's own thing. I merely didn't push hard. I got on my hands and knees hoping it would make it easier not to push but it did the opposite. With every contraction I kept saying "I can't NOT push!" Finally it was so strong that I had to push hard and I couldn't help it. The CNM came back in and I laid down so she could check the lip and she said the hands and knees position must have done the trick and called the team back in. I had wanted to use gravity but I was so tired at this point that I decided to stay on my back. I thought it might be risky in make the labor stop or slow down or something, but I decided to take the chance because I need some sort of rest. I pushed and after maybe 10 minutes the CNM made a circle with her finger and thumb to show me how much of the head was showing. I said, "that's not very much" and she said it was a lot and told me to feel it. I didn't want to feel it. I wanted to push. She kept insisting that I feel the baby's head coming through so I finally reached down and felt it. There was just a little bit there which made me feel frustrated like it was taking forever. I wanted to get him out NOW! I said "That's not enough scalp!" and pushed harder. It was only a few pushes later and he was out. I tore but it wasn't deep. She said he came out a little crooked (just like Luke) and with his hand on his head so I basically had to push his head and shoulder out at the same time. Silly kid, put your hand down! Oh well, it's a good thing he was so tiny! So my CNM put him right up on my belly and said his cord was too short so I'd have to wait for a second to hold him. She had Tyler cut the cord, which was cool. We'd talked about if he wanted to or not and he couldn't decide. He was probably surprised by it because she just handed him the scissors and said cut right there. So he did what he was told and they placed him on my chest. I looked at my little baby boy and thought "Daxton, he looks like a Daxton." We'd been going back and forth between Daxton and Wyatt for a long time. Then we both weren't sure if either of those were good names and we were at a complete loss because we couldn't find any other names that we liked. So when we decided we'd just have to see what happened when he came out. Daxton felt right. I wasn't sure I'd feel that way about either of the names, but I'm really glad that feeling came. After that I just couldn't get over how tiny he was. I held him for a few minutes but I was so tired I could barely keep my arms up. I'd been working through contractions for 2 days and my body was exhausted. I let the nurse take him to the other side of the room to weigh and measure him. Tyler went over with her and took pictures. My CNM was busy numbing and stitching me up and I was being a real wimp about it. I'm a little embarrassed at how many times I whined that it ached and that I couldn't stop my body from shaking. Everyone was really nice though and told me I wasn't being a wimp and that it was pretty normal to not have much patience left for the stitches after everything else. I still feel like a wimp for that part though. As I laid there trying not to be a wimp, they brought Dax over to me and the nurse said, "Do you hear how he's grunting? That means that he can't fill his lungs all the way. I called in a specialist to look at him and she said we need to take him to the transition nursery to put him on some oxygen to help him fill his lungs." I thought this might happen seeing as we were only to the 37 week mark, and it seems pretty common in babies born early. Tyler asked if I wanted him to stay with me or go with Dax and I told him to go and I'd be fine. When I finally got to leave the birthing room to go to my recovery room that would be mine the remainder of the stay, I asked them to take me to see Dax. They let me hold him even though he was hooked up to stuff and I was grateful but I couldn't hold him very long. I was tired and feeling weak. I hadn't really had anything to eat for a long time. I asked permission and then handed him to Tyler who hadn't gotten to hold him yet. That was a sweet moment. He's such a good dad. He didn't hold him long because he could tell I was uncomfortable in the wheelchair but we got an update first. They had started his positive pressure at a "6" whatever that means, and then they tried to cut it back and he didn't do well so they bumped it back up. They would try to wean him again soon and they said he had 6 hours, or until midnight, to get off the positive pressure or he'd be admitted to NICU. If he got off of it before midnight without a problem then he could come to our room to stay. So we hoped for the best, kissed Dax and we went to our room. Tyler went back and forth for a couple hours to check on Dax and to be with me. My parents arrived around 8:30 and suggested that my dad help Tyler give Dax a priesthood blessing. I'd been thinking about it, but I didn't think they'd let my dad in because they told us only Tyler and I would be allowed in the transition nursery to see Dax and any other visitors could look through the window. My parents said the hospital was required to let members of the clergy in to perform blessings. We thought that was pretty cool so Tyler and my parents left me to go give Dax a blessing and I ate my dinner. The nursery people were very nice. They let my mom in too. Maybe an hour later they said Dax was improving a lot and he was down to a "2". Shortly after that they said they wanted me to come try to nurse him. So Tyler wheeled me down there. When we got there his number was so low that he was practically off the oxygen. As I tried to nurse him I kept pulling the stupid tube out of his nose. So the nurse said, "it's been long enough, let's see how he does without it." and she took the tube off. Yay! Such a blessing! So I kept trying to nurse him but he was so tired he wouldn't wake up enough to nurse. They said I could try again and to just give them an hour to see if he could stay off the oxygen and if so they'd just bring him to us. We left and an hour later he got to come to our room to stay! He never had a set back after that and he hasn't had any trouble breathing. They did blood sugar tests every 6 hours for the first 24 hours but he never got too low and after I started feeding him every 2 hours his numbers were great and they weren't worried at all. Tyler's parents brought Luke to see us Monday morning, but Luke was extremely tired because he hadn't slept well the night before so he really didn't care. It was a little disappointing, but I kinda thought that would be the case. Now that we've all been home, he loves to be next to him and to be "soft" and give him hugs. He always stands next to the changing table on his big boy bed and watches while I change Dax's diaper. He's such a sweet big brother. We got to leave 4ish hours early from the hospital Tuesday afternoon. They had told us we would have to stay 48 hours to make sure Dax was good to go. That would have been 6:00pm and I was going crazy in that room. I hadn't left that room since I tried to nurse Dax in the transition nursery. The pediatrician said Dax checked out and he would put his release as anytime after noon. So we ordered our last free meal off the hospital and ate lunch before the nurse came and went over the discharge stuff. I'm so grateful we weren't stuck there for a week like we were with Luke. Dax is a really sweet boy and I can't wait to see how he and Luke grow up together! But I don't want him to grow too fast, I love to cuddle my little guy. Congratulations, Bre! I think it's awesome how smart you were at listening to your body and watching out for Tyler's sanity, too. What a cute little baby, too! I hope you're enjoying your newborn snuggles, and getting a few naps in while you can! Congrats, you all did such a great job! I'm glad that he progressed well after the blessing. I really want to snuggle that little guy again! I love reading birth stories :) It brings back so many good memories! I'm glad you are both doing good - congrats! congrats! What a neat story thanks for sharing. Can't wait to meet him!